The Renault Duster is already a preferred car for all consumers today but this is not stopping the french car maker to add more features to the car. The car maker has recently introduced the Touchscreen navigation system which would come equipped only in diesel optional RxL 85 ps and RxZ 110 ps variants. The Duster comes equipped with an audio system with Bluetooth, USB and aux, and all these features can be operated via the new touchscreen unit that includes navigation as well. The navigation system can be operated via both the touchscreen and steering column-mounted controls. This system shows details in 2D, 3D as well as bird’s-eye view format. It will be called as "Media NAV system"
Features Radio, Telephone support, Navigation system. Can be operated through steering mounted audio controls also. Renault Duster will now even be more appealing to the customers who are opting for Diesel high end variants. Also, it would be seen as an add on feature and the carmaker would like to make it more attractive since the American carmaker Ford is almost on the verge of launching the car - EcoSport now. Stay tuned for more Interesting Updates on the two most popular SUV's in India. 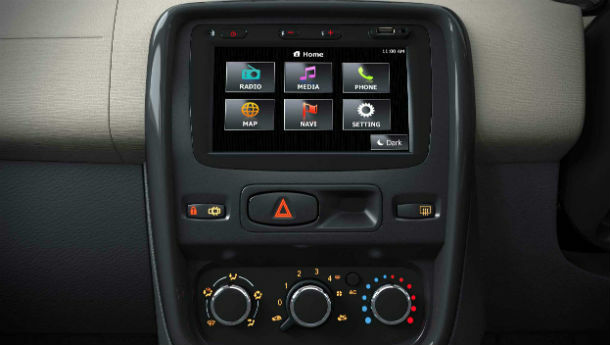 hello , im from Italy , i want to know if this nav touchscree is also avaiable for Duster Dacia ( not Duster Renault ) thanks !! !